highway trailer into a multi-use over-the-snow carrier to pull behind your snowcat. 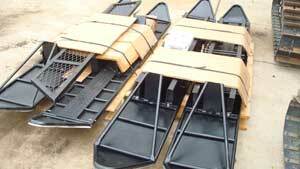 Uni-Ski Single Axle Kit: $1,875 a set. Uni-Ski's Tandem Axle kit: $2,175 a set.